The Masseria Cervarolo is located in one of the most beautiful place of the Puglia region, the ”valle d’itria”. It is the capital town of Puglia and it is 85 km far from here. 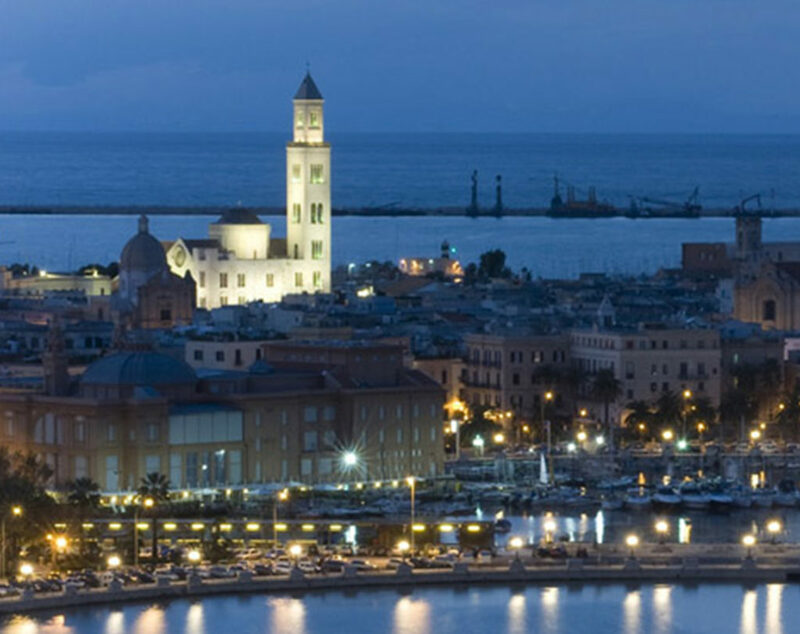 A visit to Bari is very worthwhile in order to have a different view of the regional culture. Bari has its old origins dated back to the Bronze age (4000 years ago) and because of the many and different invaders during the centuries the architecture of the city is various and very interesting. Bari is divided into different parts and each of them offers different attractions. 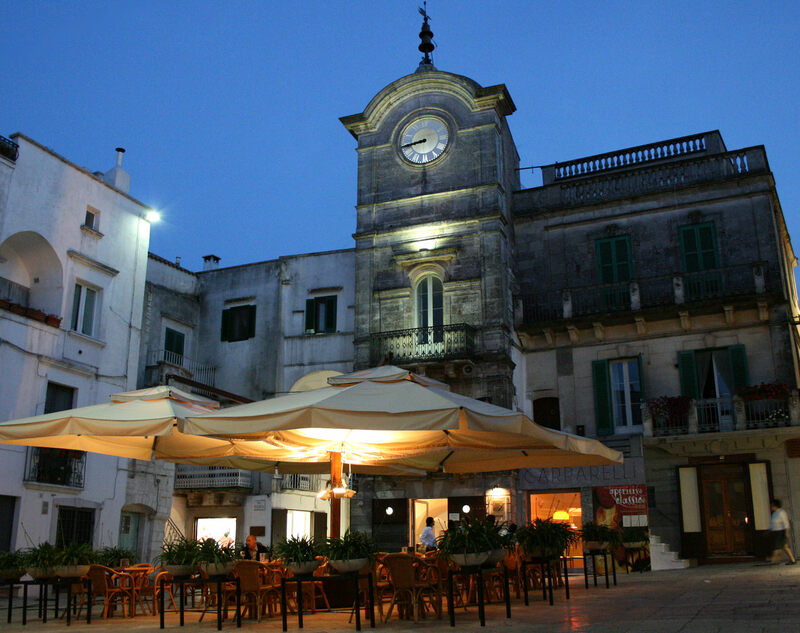 Barivecchia, the old town, must be visited as well as the Lungomare ,the harbor of the city, and the centre of the city with its main streets and shops . Bari is very famous for its theatres like the mighty and remarkable for its red-painting Teatro Petruzzelli and Teatro Margherita and for the different and beautiful churches like the Basilica of Saint Nicola where many researchers believe that the Holy Grail is buried or the Cathedral of Saint Sabino where ,every year ,thousands of pilgrims pilgrimage to demonstrate their strong faith. Also the Swabian Castle and the Russian church can’t be missed. Bari is very famous in Italy because of its delicious and fresh seafood, for its typical “focaccia” and “panzerotti” so, before leaving, why don’t you try some? Despite the fact that Matera isn’t situated in Puglia but in Basilicata, it is undoubtedly a must-see place and it is approximately 90km away from the hotel so we strongly suggest to have a visit of the place. Matera nowadays is a renowned place worldwide and it is part of the prestigious list of the Unesco world Heritage since 1993. Because of its incredible beauty, in the last years, many famous films were recorded in Matera like ,for example, “The Passion of the Christ” of Mel Gipson. 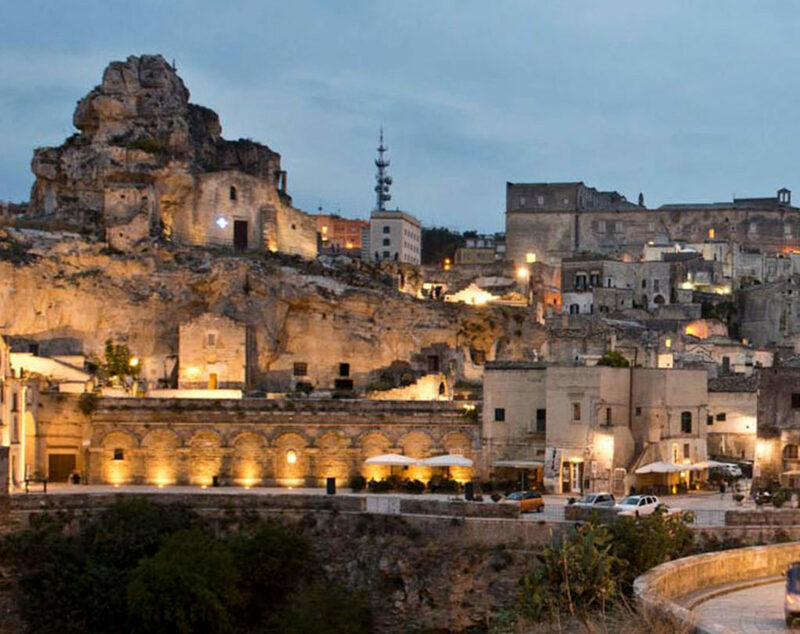 Matera is particularly famous for the “Sassi of Matera”, the old part of the town which dominates the valley. The Sassi of Matera and their park are an outstanding example of a rock-cut settlement, adapted perfectly to its geomorphological setting and its ecosystem. They represent an outstanding example of a traditional human settlement and land use, showing the evolution of a culture that has maintained until today a harmonious relationship with its natural environ-ment. Lo Zoo Safari è un parco nato come faunistico nei pressi della Selva di Fasano e che negli anni ha diversificato la propria offerta puntando anche su attrazioni meccaniche collocate in un’area che a tutti gli effetti è oggi divenuta un nuovo parco, Fasanolandia. Il parco faunistico è il primo in Italia ed uno tra i più grandi di Europa per numero di specie presenti. Accoglie infatti circa 1700 esemplari di 200 specie diverse, in una zona con macchia mediterranea estesa per circa 140 ettari. Tra le tante attrazioni la zona dei Gorilla, con gli unici esemplari presenti nel territorio italiano; il metrozoo, trenino che permette di visitare un’oasi con cascate e animali come orsi bruni, orsi polari, giaguari, leopardi, ippopotami, rinoceronti, foche e gibboni; la sala tropicale, con numerose specie di pesci e rettili. 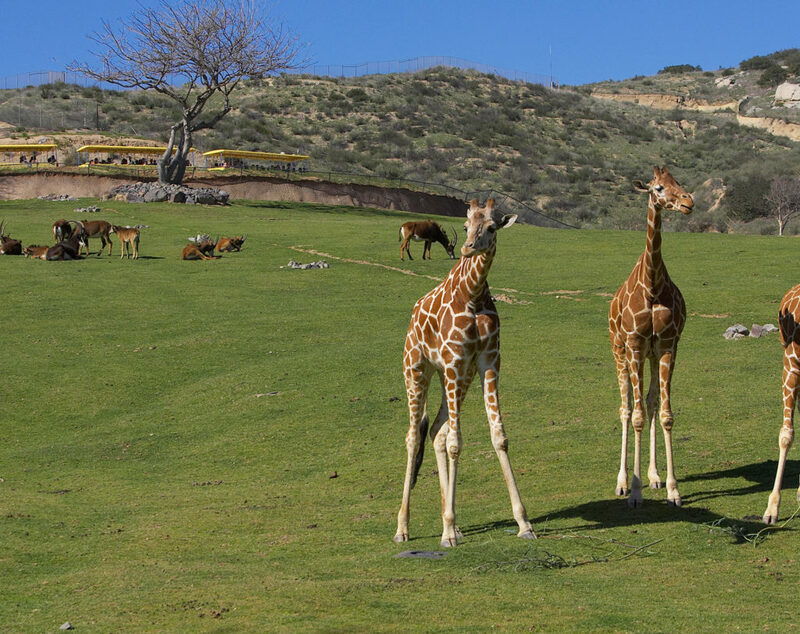 La visita dello Zoosafari impegna da una a tre ore compresi i reparti faunistici pedonali. All’interno di Fasanolandia si possono trovare diverse attrazioni tipiche dei luna-park e alcune realizzazioni più importanti come il rollercoaster “Mirage Rosso”. Sono presenti anche show di artisti e di animali, mostre, riproduzioni in miniatura e naturalmente i servizi tipici di una struttura permanente che ogni anno ospita diverse centinaia di migliaia di visitatori. I parchi sono visitabili anche singolarmente. 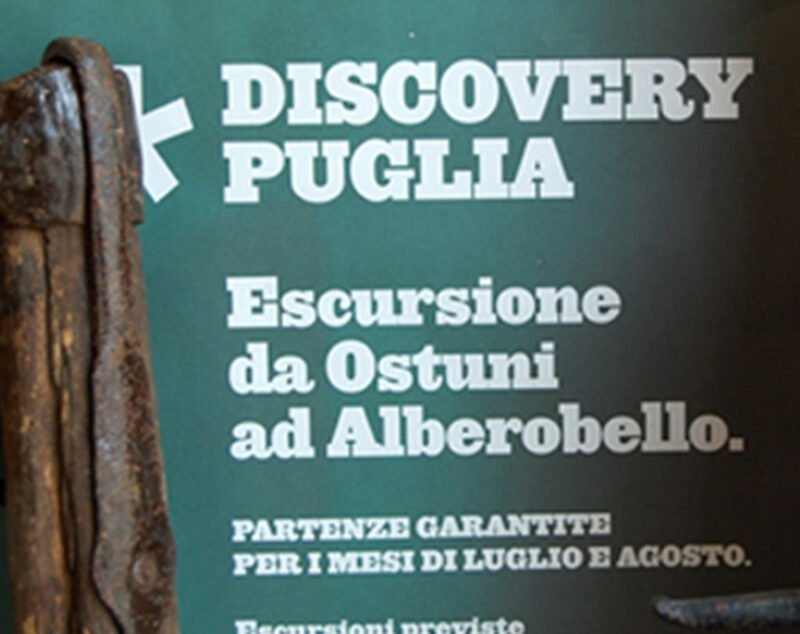 Lo zoo ha origine da una masseria, allora azienda agricola Pedali, che diede origine ad un modello alberghiero, oggi comunemente conosciuto come agriturismo, intendendo offrire ai propri clienti venuti in vacanza un parco divertimenti. Il parco fu aperto il 25 luglio 1973 con la parte zoo, successivamente fu aperto il parco divertimenti. 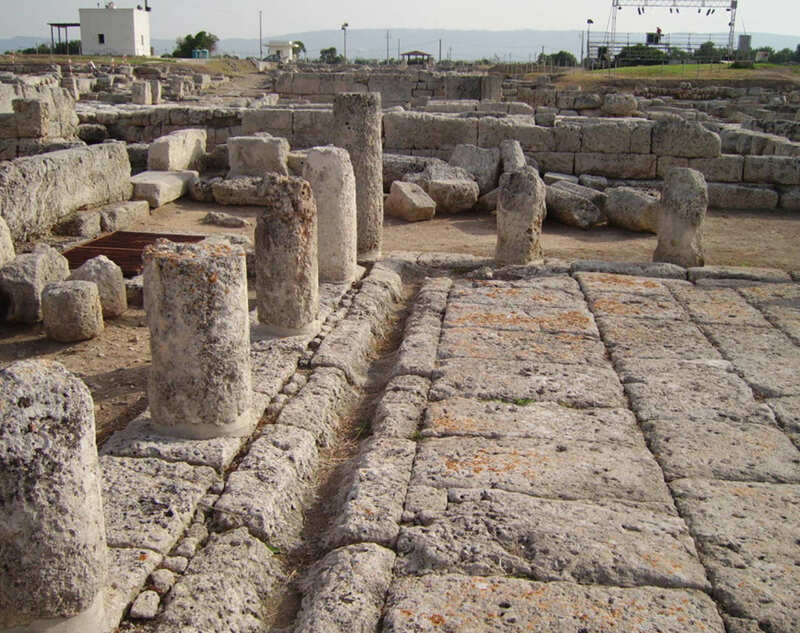 The archaeological site of Egnatia, placed 25 minutes away, in an amazing natural environment, is one of the most interesting sites of Puglia thanks to its history of 30 centuries. The city, cited by authors such as Pliny, Strabo and Horace ,had a great importance in the ancient world for its geographical position, thanks to the presence of the port and the Via Traiana, in fact, it was an active center of trade and commerce . The history of the ancient Gnathia had different stages over the centuries. The first settlement, made up of a village of huts , was built in the fifteenth century. a. C. (Bronze Age ) . In the eleventh century. a.C. ( Iron Age ) an invasion of Iapigi,a population set in the Balkans , took place. While during the eighth century. a. C. begins the messapica phase for Egnatia, as for all the Salento ,that will end with the Roman occupation in the third century . a. C. The city will join the first republic and then it will become part of Roman Empire with which it will decline. Of the messapica phase of Egnatia remained the mighty defensive walls ( 7 m high . , 2 km long delimit an urban area of about 40 hectares ) and the necropolis , where in addition to graves and half-chamber , there are monumental tombs room decorated with fine frescoes. Of the city, only partially excavated , preserved vestiges dating back to the Roman period . 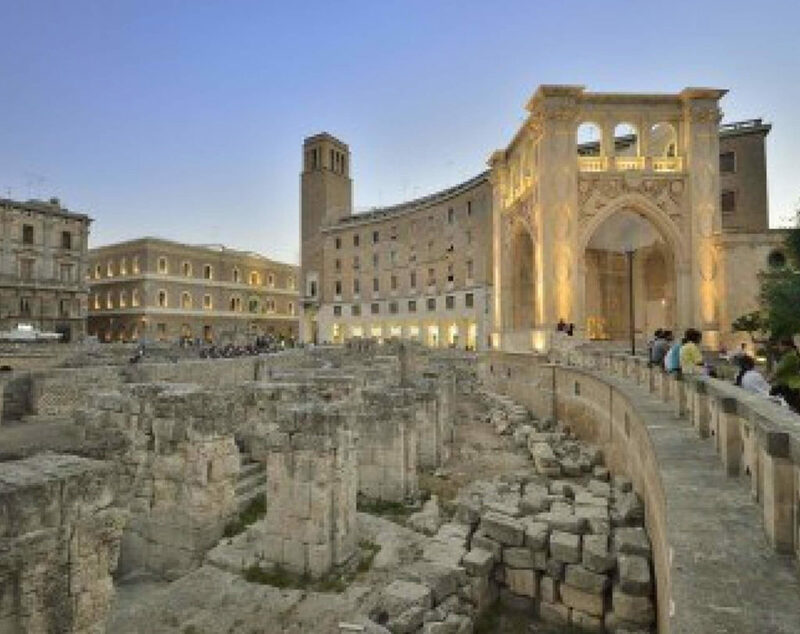 Considerable remains of the Via Traiana, the Civil Basilica with the class of the Three Graces , the Shrine of the Eastern gods , the amphitheater, the hole . Excellently preserved cryptoporticus . There are also two early Christian basilicas , originally with floor to mosaico. The Archaeological Museum , recently renovated is of great interest. 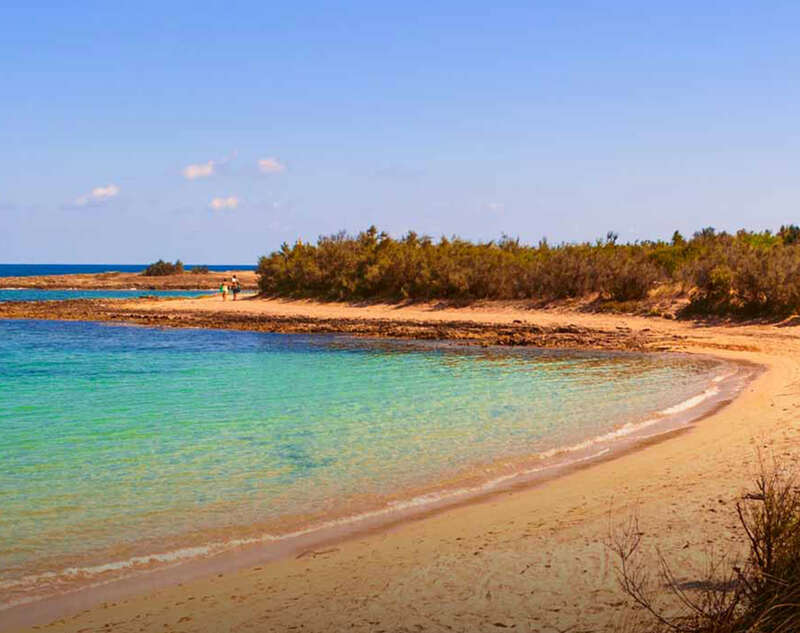 This natural park of Dune Costiere is 15 minutes far by car from Masseria Cervarolo, it stretches over a flat and sandy coastal area characterised by wetlands located behind a dune belt. Dunes form a continuous string that is interrupted only by access ways to the sea. Some stretches are home to the typical juniper vegetation. The dunes that are less affected by human activities have the typical sclerophyllous evergreen vegetation with a predominance of broad-leaved Phillyrea and Pistacia lentiscus. 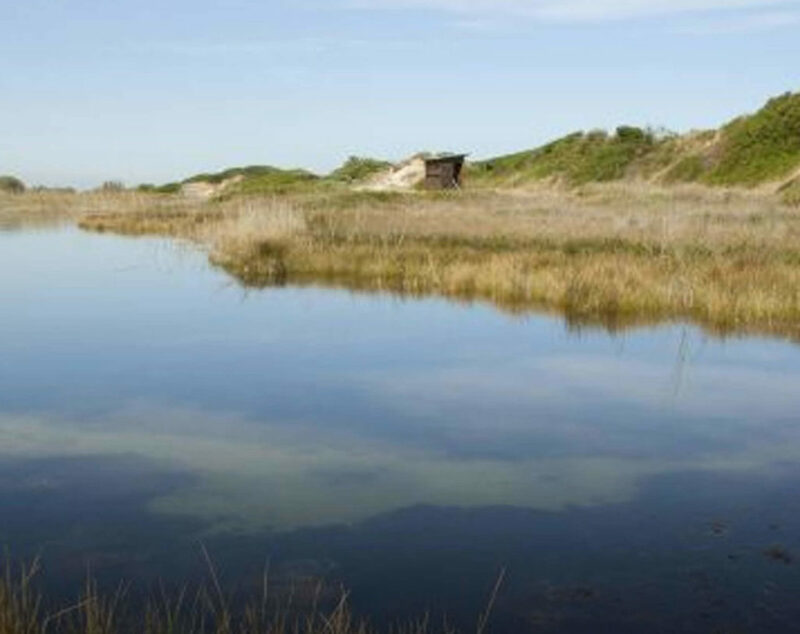 The wetlands behind the dunes consist of small brackish lagoons with halophyte vegetation. The innermost areas, in the locality known as ‘Difesa di Malta’, are characterised by a low garrigue vegetation (to be precise the species Thymus capitatus) and large zones with very xerophilous and thermophilous sub-steppe vegetation. Volunteer orchidaceous plants thrive in this area and wastelands with Asphodelus ramosus are found due to overgrazing. Overall, this reserve has a high natural value, as shown by the number and quality of its habitats (4 priority habitats and 4 habitats of Community interest) and its species (5 priority species of Reptiles and as many as 24 species of birds of Community interest), which are included in the lists of the Red Book of the Animals of Italy. Consequently, this area is not only a breeding site, but also and especially a staging post for rare and endangered species of the avifauna, thus playing an important role in the conservation of migratory birds crossing the Adriatic Sea. The reserve aims, among other things, to ease the high human pressure exerted on this ecosystem. For example, the numerous paths between dunes are enlarged to enable bathers to reach the sea and more and more sand dune surfaces are used as car parks in summer. 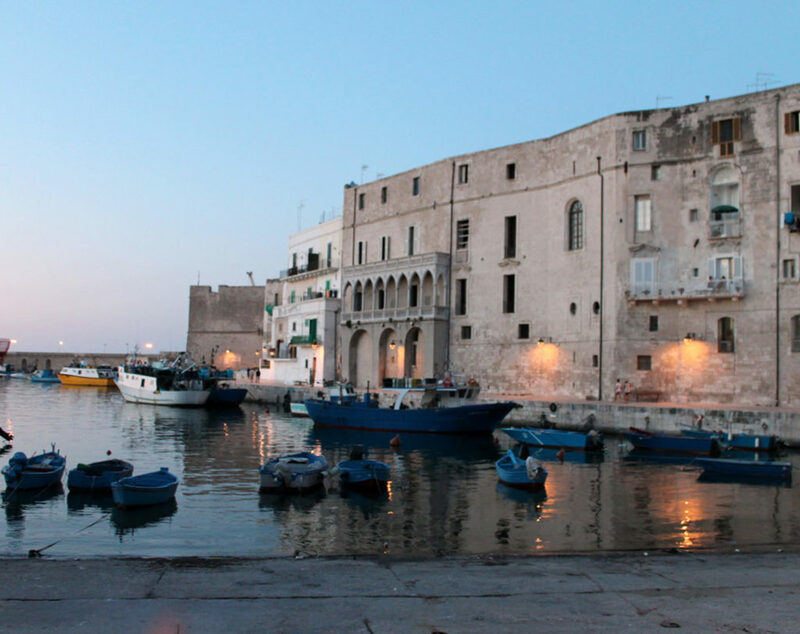 In the middle between Bari and Ostuni, this town is just 30 minutes driving from the Masseria. 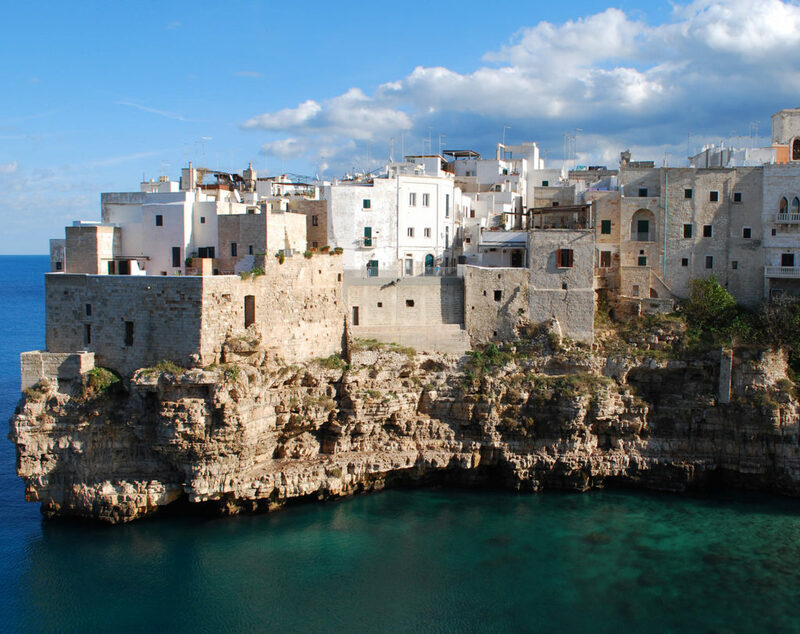 Polignano made its name thanks to its marvellous coast and because of the attendance of breathtaking caves in the towering cliffs where a visit is strongly suggested. Few years ago Polignano was awarded with the “Blue flag” because of its clean and blue sea, so it is the perfect destination for those who are looking for a beautiful place to spend a sunny day. As well as the sea, Polignano has a very particular town centre which overlooks on the sea and is dated back to the Greek Age as it is attested by many coins found on the site. In case you decide to spend a day in Polignano don’t forget to try their very famous gelato in “Bar Turismo” or “Mago del gelato”, although the places look a bit quirky and old the gelato is very sophisticated and the receipt is secretly kept! The main town of Salento is about 85 kilometres from Cervarolo. Built in the local and soft limestone, Lecce , also known as “The Florence of the South”, is a surprising town and is one of the Baroque masterpieces of Southern Italy. Legend tells us that a town existed near the site of Lecce right back at the time of the Trojan Wars, though this is hard to verify. What is sure, however, is that the town was taken over by the Romans in the 3rd century BC. Evidently not caring much for its position, they moved it 3km north, began developing its potential and renamed it “Licea”. 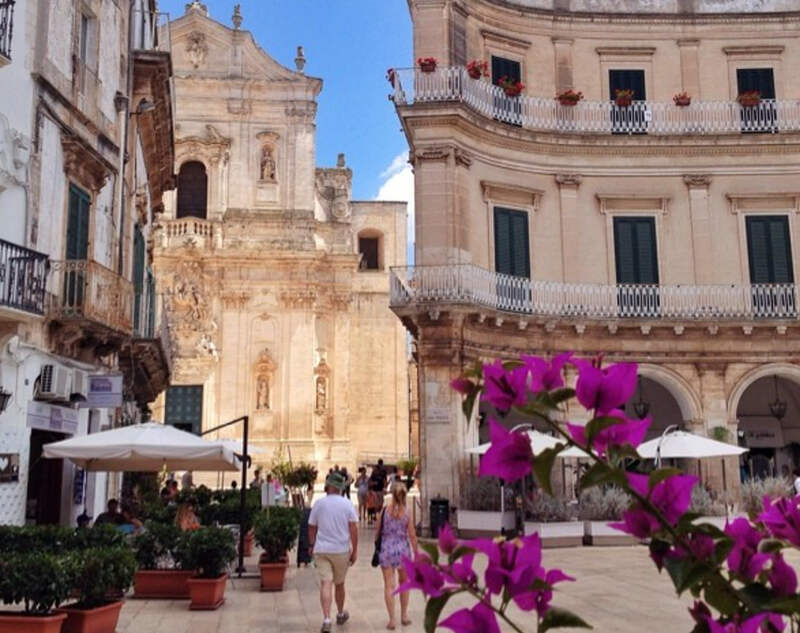 Once you will get lost in the spider’s web of streets, you will be enchanted by alluring glimpses and perspectives of old churches and squares which make this town unique in Puglia. Lecce is a quiet small town so tourists can easily visit it walking. While venturing in the old town do not miss the amazing Piazza del Duomo and the centennial Basilica of Santa Croce which has one of the finest and most intricate Baroque facades in Italy. Keeping walking you’ll face The Church of Saints Niccolo’ and Cataldo, a fascinating Norman church built by King Tancred of Sicily in 1180. It is the perfect mixture of Norman austerity and Italian Baroque accu-racy. The Statue of Saint Oronzo, in the very heart of the old town, is one of the symbols of Lecce because He is considered the patron Saint of the town. Just 25 minutes driving away from here, was built on a whole rock of limestone so the town is full of breathtaking caves and for this reason the city was named Grottaglie, from the Latin “Kriptalys”, which means several caves. Grottaglie’s origins date back to the Palaeolithic age but the most important historical remains date back to the medieval period when the population began to settle and make the caves their home. The Bishop’s Castle was built in the 15th century by order of the archbishop of Taranto, which had also ordered the construction of the fortification walls. Essential elements of the castle are the large central square and its square tower. It was later enlarged and remodeled, with a facade of the Baroque period. The castle is now owned by the city council and hosts the “Museum of Ceramic” which exhibits ceramics dating back to the 8th century BC till today. Of considerable historical and architectural importance is also the Mother Church. 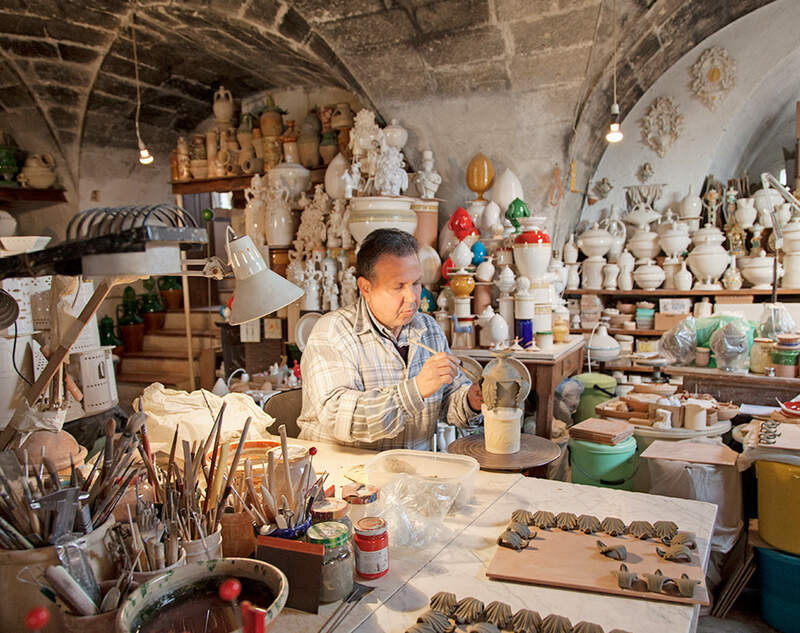 While visiting Grottaglie remember to visit the typical ceramic shops which made this place renowned worldwide. It is about one hour and half driving from the Masseria. 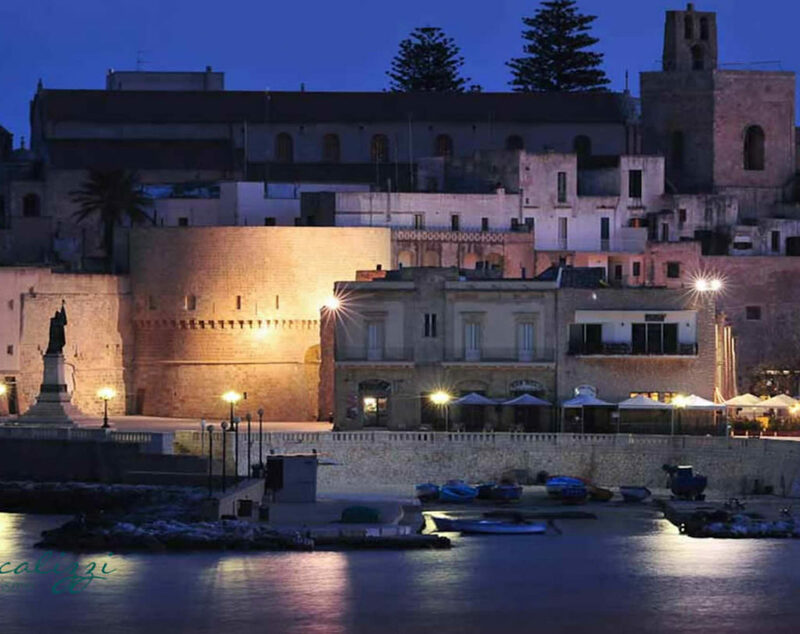 Otranto is a historic seaside town and port in the heart of Salento, which is the heel of Italy’s boot. Like much of Puglia, Otranto has a colourful and mixed past. It was important as a Greek and then Roman port. Otranto’s leading attraction is the twelfth-century mosaic in the town’s Romanesque Cathedral. Pictures within the mosaic include religous stories like Noah’s ark, but also depictions of historical, mythical and even pagan figures, including Alexander the Great and King Arthur. 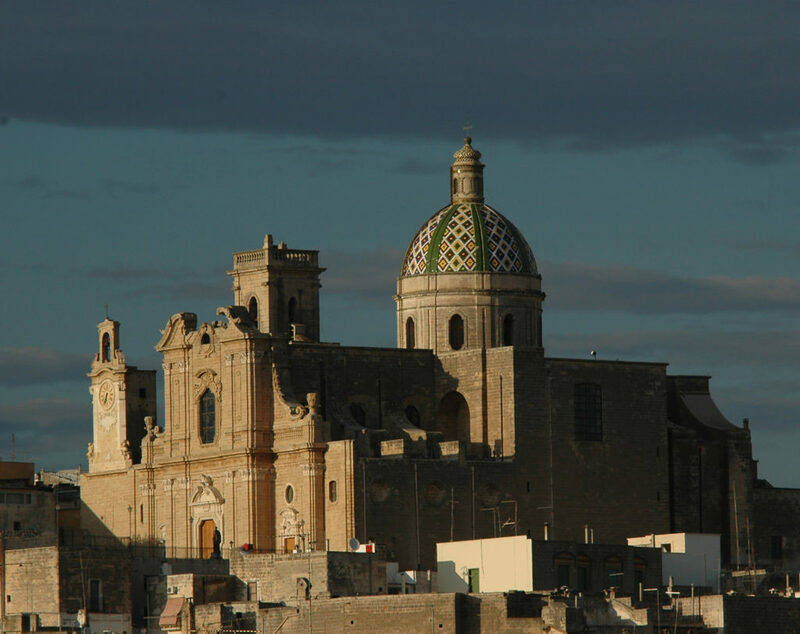 Not far the Cathedral there are the interesting Museo Diocesano and the church of San Pietro, which was believed to have been once the principal church of Otranto. The Castle of Otranto or Castello Aragonese, is a mighty construction which forms part of the tough defences of Otranto. The current building is fifteenth-century, though it was built on one of Frederick II’s earlier fortresses. In addition to these tourist sights, visitors can simply walk through the historic town, coming across picturesque scenes and views. The centre is still enclosed within its defensive walls, which gives a real sense of history. Further atmosphere can be appreciated among the crumbling ruins above the Harbour. After or before visiting Otranto it is strongly suggested to have a swim in the spectacular and clean sea of Otranto! This town is about 35 minutes driving from Cervarolo. According to the Greek historian Erodoto (484 BC), Oria was founded by a group of Cretan castaways, who chose its height above sea level as a defensive element and named the new city Hyria. To enter Oria, one has to pass through one of its three portals. The Castle dominates the suburb, which still has its Medieval walls, situated on three different hills which snake through narrow characteristic streets dotted with buildings and churches rich in history and fascination. The Cathedral, rebuilt in a Baroque style after the 1743 earthquake, conserves paintings and traces of the remote past of Oria: Messapian remains, a Roman cistern and tombs of bishops. Close to the Basilica, you can visit the Palomba Tower or Carnara, which seems to have been the last existing bulwark from the ancient Messapian City. Close to the centre and Basilica, you can enjoy a visit to Palazzo Vescovile and Palazzo Martini. About 25 minutes away by car from Masseria Cervarolo there is the Natural reserve of Torre Guaceto, the reserve stretches over nearly 1,200 hectares. At the top of the Nature Reserve visitors can explore an area featuring great century-old olive olive groves, a symbol of Puglia’s agricultural status and a true Mediterranean landscape containing both sand dunes and wetlands. Another part of the reserve has remained a wetland and is therefore populated by birds, amphibians and insects common to this kind of habitat. Among the sporting and recreational activities organized in the reserve are special excursions including 2-hour walks along paths of medium and low difficulty levels and mountain biking on routes that allow visitors to appreciate the different parts of the reserve. Also, for those wishing to explore the marine reserve as well, interesting seawatching activities are available during the summer months. Booking is required for all these activites. A cycle hire service is also available to visitors. All year round, there are environmental and general educational activities for schools on the naturalistic aspects of the reserve. Monopoli is just 25 minutes driving by car from Masseria Cervarolo,it is situated in the province of Bari, extends along the Adriatic coast and is a predominantly flat territory. An exception to this is “Loggia del Pilato”, a natural terrace that dominates over the underlying flatlands. There are 25 sandy beaches along the 13 kilometres of sea front. The agricultural aspect of the territory is divided into 99 districts (contrada) identified by the presence of fortified farm houses, churches, rock dwellings and villas; the predominant crops are olives, almonds, fruit orchards and horticultural crop rotations. 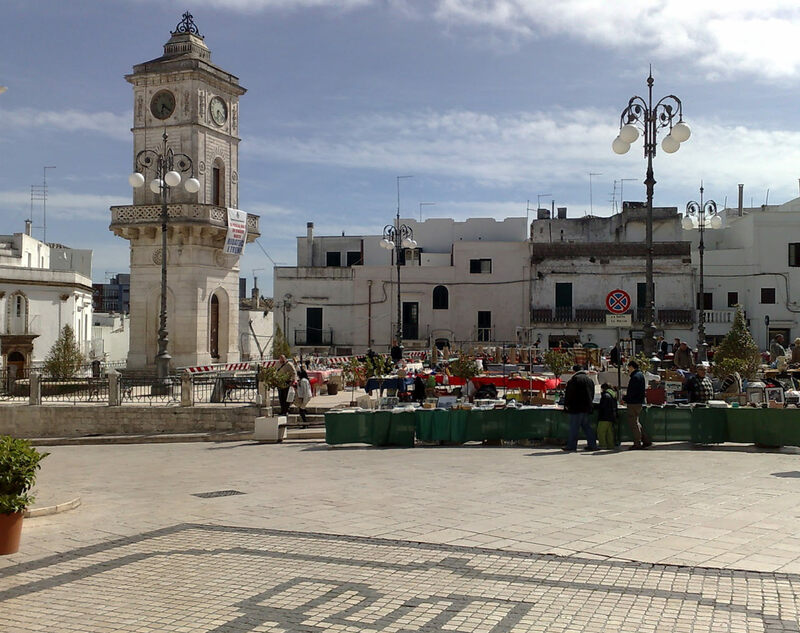 The name Monopoli means sole city and was most probably utilised for the first time when the citizens of the nearby Gnaza, destroyed by the Goths of Totila, moved into what was considered at the time only a small village. As with many other towns in the region, Monopoli was ruled over the years by the Normans, Byzantines and the Swabians, Under Venetian rule and thanks to the expansion of the port, the city attracted great interest from foreign markets. Following Spanish and Austrian rule, the city was annexed to the kingdom of Naples state and then to the kingdom of Italy. 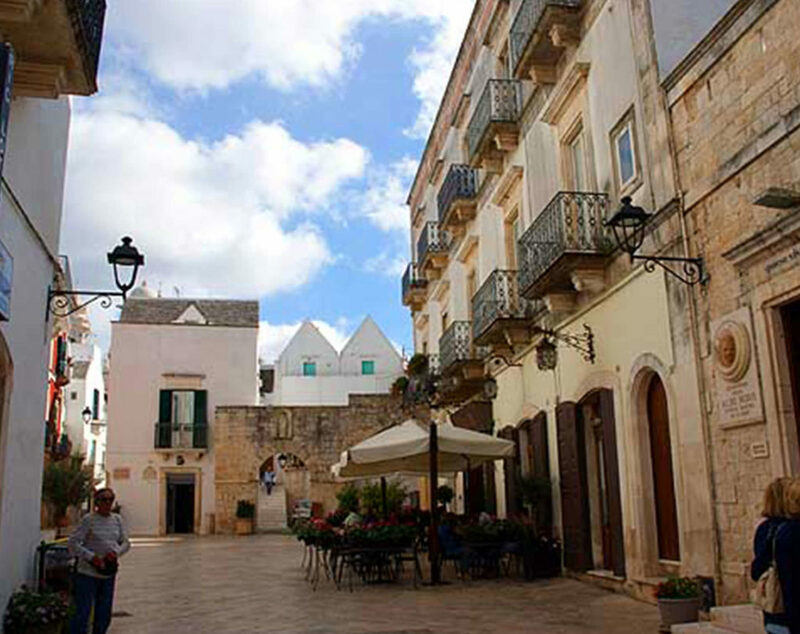 Being just 7 kilometres far from the Masseria , this town is undoubtedly a place to visit. Ostuni was built on the top of a hill by the Messapi around the VII BC although there are traces of hum an settlements which can place the origins of the city in the Palaeolithic period. It can be confirmed by the discovery of a skeleton belonging to woman later named as “Delia, the Woman of Ostuni”. The skeleton that was found in the cave of Agnano was of a woman who was pregnant at the time of death, her body was later dated to be about 25,000 years old. 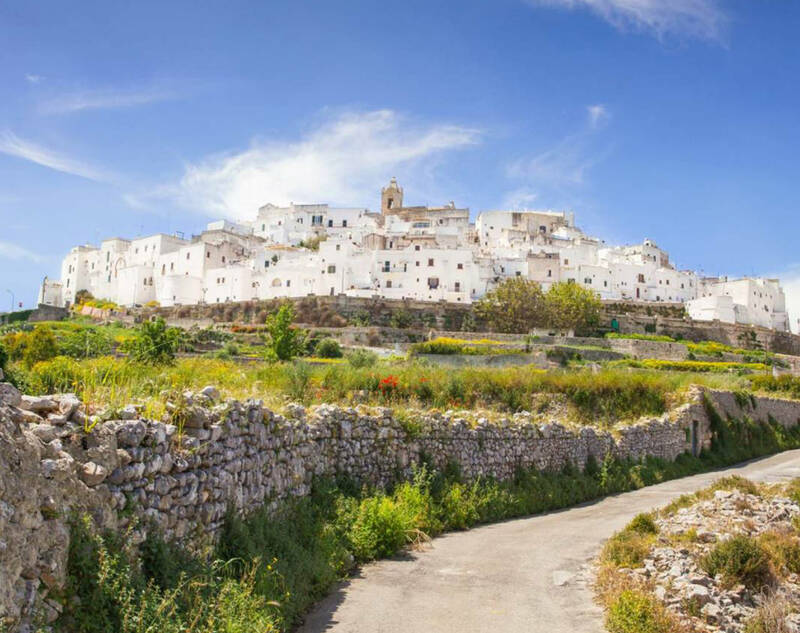 During the Middle Ages the white lime was a way to prevent the spread of the plague, this is how Ostuni gained its nick name “The White City”. Famous for its very narrow streets, the town has beautiful shapes and offers breathtaking views from the ancient walls which still surround the historical centre. The Cathedral is situated on a hilltop surrounded and protected by the houses of the old quarter, it can be reached by walking along the only road that connects the Cathedral to Piazza Libertà , a narrow and winding road but very characteristic and full of little shops and boutiques. About 30 minutes driving from Cervarolo, this small and fairytale town is renowned in the world and it’s part of the Unesco Heritage for its typical houses with their bizarre and unique conical roofs. There are many and various legends but the most convincible story behind the origins of this design is the one due to high taxation on property and houses. That is why local people created dry wall constructions so that they could be dismantled when inspectors were in the area so that they didn’t have to pay taxes. Just 5 minutes driving away from Masseria Cervarolo, this town is part of the very prestigious club of the most beautiful boroughs in Italy. Because of its magical atmosphere, many tourists choose to visit this very ancient borough and dine in the typical narrow streets where many local butchers are situated and people can taste the exquisite “bombette”. In just a 15 minutes walking it is simple to have a look of the beautiful churches like the church of S. Nicola or the several and beautiful buildings like “Porta Grande” and “Torre del Municipio”. Most of all do not miss the stunning panorama of the Itrian Valley from the Belvedere Balcony perhaps taking a bite of the delicious desserts that the Vignola Bar offers. No more than 18 km away from the Cervarolo, this town is part of the club of the most beautiful boroughs in Italy like Cisternino. It is called Locorotondo, which literally means “round place”, because of its unique shape. The white Locorotondo is probably the most beautiful balcony of the Itrian Valley. From its Belvedere it is possible to admire the landscape which is amazing: a mosaic of little vineyards surrounded by drywalls , Mediterranean plants , secular olive trees planted by the walls of ancient Masserias, thousands of trullis and narrow country roads. All the old houses were built using limestones in the typical Baroque style. Before leaving Locorotondo do taste the famous Locorotondo D.O.P. , the fresh and local white wine. The Grotte di Castellana are one of the most important attractions of Puglia and natural heritage of inestimable value to Italy. 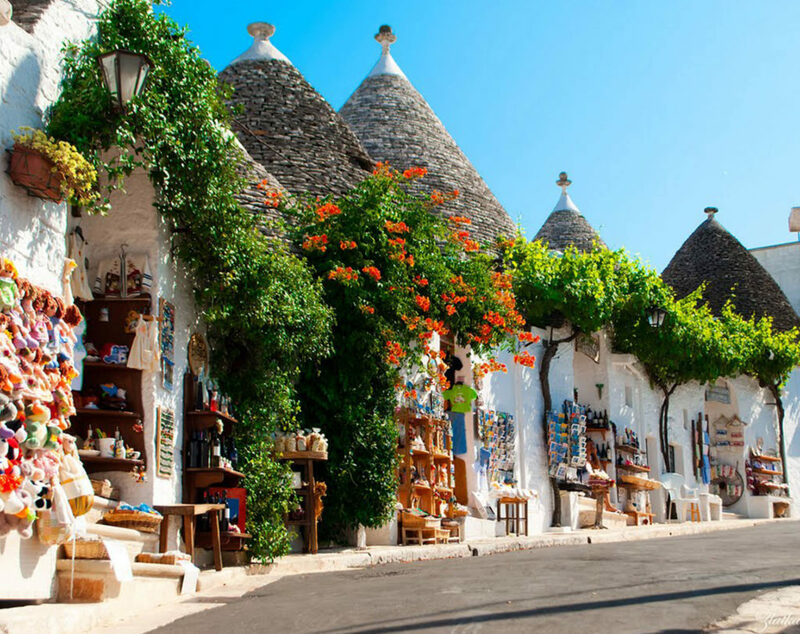 Located at the entrance of the Itria Valley, a few kilometers from charming villages such as Alberobello, Cisternino, Polignano a Mare, the Grotte di Castellana began to form about 90 million years ago. The beauty of the Caves of Castellana attracts tourists from all over the world and since the day of their opening have marveled more than 15 million visitors. The tour winds along a distance of 3 km, a unique guided tour of the caves to more than 60 me-ters deep in an amazing scenario made of stalactites, stalagmites, concretions, incredible shapes, fossils, canyons and caves with fantastic names; calcifications from conformations and amazing colors solicit the imagination of children and adults. During the exploration, at a constant temperature of around 16 ° -18 °, you will fell wonder and astonishment for the great show the nature give; in hundreds of millions of years the nature has shaped the rock into fantastic speleothems in wich young and old people like to recognize something or someone. The Caves of Castellana are a good opportunity to enjoy one of the most amazing natural wonders of a wonderful Puglia. Far from Masseria Cervarolo just 5 minutes by car, Ceglie Messapica is on altitude of 300 meters. On the top of a hill stands the old town of Ceglie, a gem of spontaneous architecture, characterized by steep winding alleys, palaces and traditional houses; on the village, made of houses added to houses, overlooks the Ducal Castle (1100). The Collegiate church or Mother Church is placed in the historical centre, in opposite of the ducal castle entrance, it was built in 1521. The others important churches are: the ancient church of S. Domenico (XVII century), is located in the historic centre, San Rocco’s church is located on the nineteenth century area of the city, was built in 1888 with donations of the people of Ceglie. The Abbey church of St. Anne is located on the outskirts, is the most ancient churches of the city, restored in 1710. Throughout the country area, are scattered many votive chapels or rural churches, tabernacles, votive shrines, isolated or adjacent to farms. The rural chapels, are not just a place to meet and pray, but they are also temporary shelter during bad weather. In Contrada Montevicoli are the Cave of Montevicoli opened to the public in August 1962. We recommend to taste Biscotto Cegliese , a famous and tipical almonds cookie, Presidio Slow Food. About 15 minutes away from the here, this town is famous for its Baroque shapes, en fact many churches like the one of San Martino in Piazza Plebiscito, the church of the Carmine, Porta di Santo Stefano and Palazzo Ducale were built using this style. While having a walk inside the suggestive centre, take a break in the renowned Caffè Tripoli and try one of their famous coffee as well as their delicious “pasticciotti”, a local and delicious dessert filled with cream and jam. This bar is a piece of history in the heart of Martina Franca. The typical “Capocollo” ham of Martina Franca must be tried as well. It is appreciated worldwide and is sold in very famous markets like Harrods in London.